The largest metallic asteroid in the solar system may have water on its surface, astronomers have found. The asteroid, called 16 Psyche, is one of the most massive in the asteroid belt. Researchers think the 186-mile-wide (300 kilometers) body, made of almost pure nickel-iron, might be the core of a world whose outer layers were blasted off by impacts billions of years ago. Previous observations of Psyche showed no water on the surface. But according to Vishnu Reddy, an assistant professor at the University of Arizona's Lunar and Planetary Laboratory, new data from the NASA Infrared Telescope Facility show evidence for water or hydroxyl, a molecule with one hydrogen atom bound to one oxygen atom, on Psyche's surface. Hydroxyl exists on Earth, but it is very reactive and tends to combine with other compounds — and in fact can remove those compounds from the air. "We did not expect a metallic asteroid like Psyche to be covered by water and/or hydroxyl," Reddy said in a statement. "Metal-rich asteroids like Psyche are thought to have formed under dry conditions without the presence of water or hydroxyl, so we were puzzled by our observations at first." Reddy presented his results Wednesday (Oct. 20) at the 48th meeting of the American Astronomical Society's Division for Planetary Sciences and 11th European Planetary Science Congress in Pasadena, California. 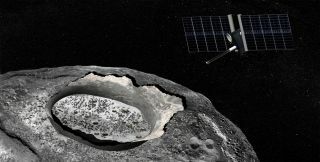 The water could have reached Psyche via past impacts from smaller asteroids that contain volatiles such as carbon, hydrogen and water, Reddy said. NASA is currently reviewing a proposed mission to Psyche, which could tell astronomers whether the signal from the surface comes from water or hydroxyl. The new research, co-authored by Reddy and led by Driss Takir at the U.S. Geological Survey, has been accepted to the Astronomical Journal, and can be read online here.